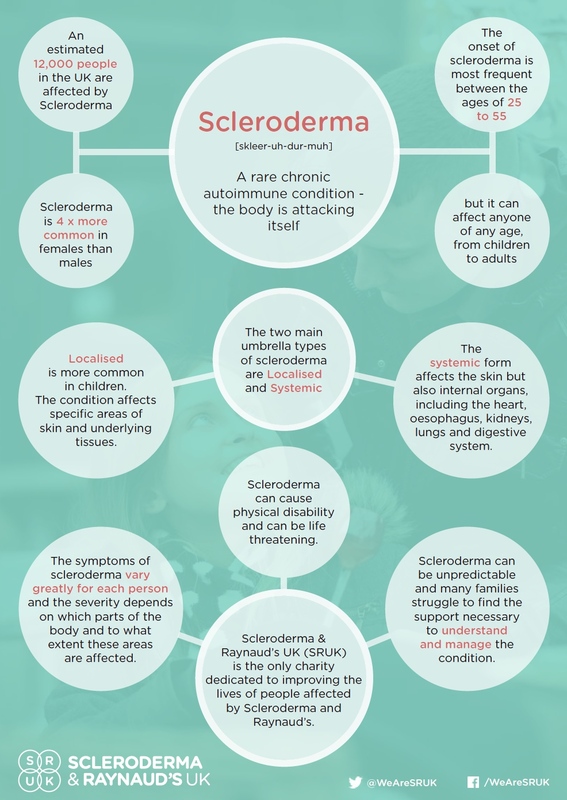 This is an annual event co-ordinated by Scleroderma and Raynaud’s UK (SRUK) - the only charity in the country dedicated to helping people with these conditions. The charity has invested more than £10 million pounds to date to help fund research projects. 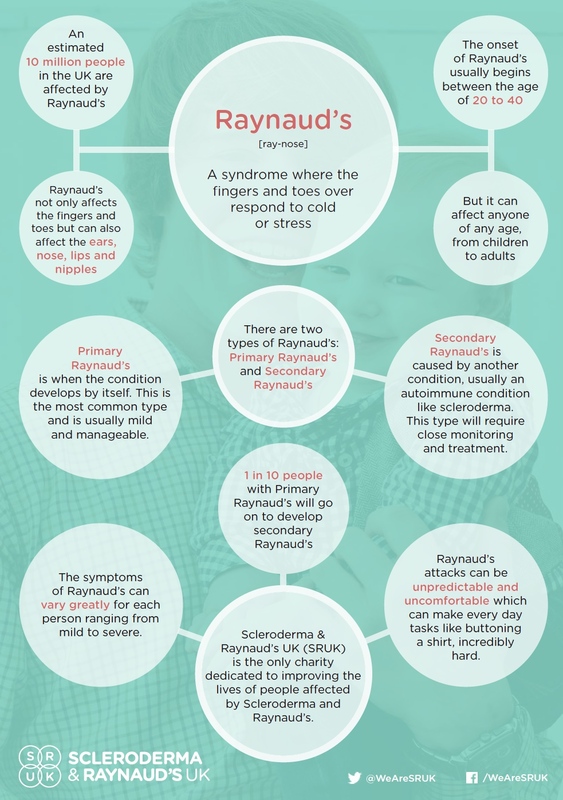 Raynaud’s affects around one in six people in the UK - so that’s about ten million of us - but despite it being relatively common, many haven’t heard of it before or don’t know the symptoms. Named after a French physician who first described the condition in the 1860s, it is a vascular disorder where the blood vessels in extremities are over sensitive to cold temperatures. Exposure to cold can trigger an ‘attack’ where a person’s fingers and toes turn white. It could be something as common as simply washing your hands or going out for a walk. The affected areas can feel numb and painful and may even turn blue, before ‘flushing’ red and returning to normal again. Sufferers can experience several attacks each day and a known trigger is stress. It can also affect other parts of the body. If you suspect you might have symptoms of Raynaud’s, take an online test on the SRUK website here. There are two types of the condition, primary and secondary. Primary Raynaud’s is where symptoms are ‘idiopathic’ i.e. they occur by themselves and are not in association with any other conditions. For this reason, it’s sometimes (inaccurately) described as being allergic to the cold! It’s more common in women and symptoms typically develop during teenage years or early adulthood. Around one in ten of Raynaud’s sufferers will go on to develop an autoimmune condition. One very rare example is scleroderma which is thought to occur in just 0.1% of Raynaud’s sufferers. In addition to Raynaud’s, the early warning signs of scleroderma include hardening of the skin, sore and swollen fingers, acid reflux and heartburn. Urgent medical advice should be sought. International Rare Disease Day takes place this year on 28th February 2019. In more serious cases, sufferers can be given Nifedipene to help alleviate attacks. This is calcium channel blocker drug, typically used to treat high blood pressure, and is the only medication currently prescribed in the UK to treat Raynaud’s. SRUK suggest wearing gloves containing silver which will help to conduct heat better, and using heat packs and hand warmers. Complementary therapies like acupuncture can also help when experiencing stress and anxiety. Where can I get advice and support? SRUK have social media pages on both facebook and twitter where sufferers can discuss the issues they are experiencing and share tips on how to manage their symptoms. New sufferers are invited to share their stories on social media using the hashtag #FirstFlare. NHS guidelines recommend you should always see your GP for further investigations if you’re experiencing attacks for the first time and are over 30 years of age, so that any potential underlying conditions can be diagnosed and addressed. We would always recommend a GP visit if you have any concerns. Your GP may arrange a blood test or refer you to your local hospital’s rheumatology department for further investigations and tests. What if my job is making things worse? Hand-arm vibration syndrome (HAVS) - also known as vibration white finger - is a form of secondary Raynaud’s. If you use vibrating tools and machinery at work, we always advise that you avoid this where possible. Your employer has a legal duty to prevent you from being exposed to harmful levels of vibration but where this can’t be avoided due to the nature of your job, you should have access to support from an occupational health advisor. Your employer should monitor your condition and take steps to help ensure it doesn’t get any worse. If you suspect your condition has been caused or contributed to by your job, our qualified industrial disease solicitors can give you no obligation advice about making a personal injury claim on a no win, no fee basis. Our team act for many clients with HAVS and the key message here is the sooner you report your symptoms and get advice, the better. As part of our service we also help clients claim for any welfare support they may be entitled to, such as industrial injuries disablement benefit. Please contact our personal injury team on 0175 321 6399. Sadly it is often the case that sufferers wait long periods before seeking specialist legal advice, only to find they’re too late to bring a compensation claim. There are very strict rules on limitation in England and Wales and a person who suspects their condition is work-related only has three years to issue court proceedings. Your solicitor can ask the court for permission to bring a late claim on your behalf however, exceptional circumstances would have to apply. We also appreciate that reporting a health problem to your employer can cause difficulties for you in the workplace. Stephensons have a dedicated employment team if you believe you are being treated less favourably at work after reporting your condition, or should you even lose your job as a result.